Shoreline Arts Alliance presents the 38th annual IMAGES Photography Competition and Exhibition, Connecticut’s Oldest State Wide Photography Competition and Exhibition. IMAGES is opening on March 20, 2019 and will be on view at the Guilford Art Center Gallery through April 6. The exhibition features work by Connecticut based photographers and was hand selected by three out of state professional judges. Shoreline Arts Alliance will also be holding events during the exhibition including the award reception on March 22 and a Gallery Talk with past judge Paula Tognarelli on March 28. 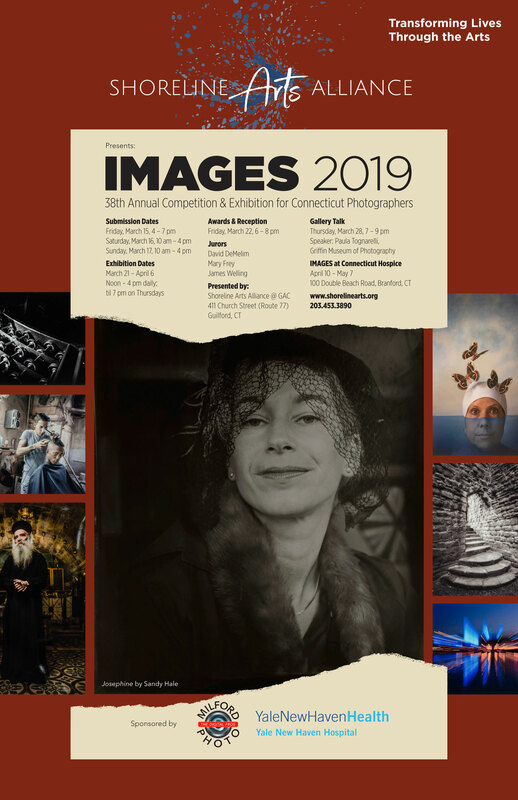 IMAGES is a jury curated photography competition that was first started by Shoreline Arts Alliance in 1981 and is currently the oldest Photography competition and exhibition in the state of Connecticut. IMAGES is open to all Connecticut based photographers of all skill level and is dedicated to encouraging, engaging, and educating new and experiences artists. The Guilford Art Center Gallery is open Mon- Fri 9 am- 5 pm, Sat 10 am- 4 pm, and Sun 12 pm- 4 pm. Shoreline Arts Alliance is looking for volunteers for gallery sitting during the Exhibition. Call 203-453-3890 or email of-fice@shorelinearts.org if you are interested. The opening Reception and Award Ceremony will be held on March 22, 2019 at 6 pm at the Guilford Art Center Gallery. Join Shoreline Arts Alliance and the many IMAGES artists as we hand out awards that were given by our judges during jurying. The Reception will have food that has been generously donated by local institutions, drinks, a scavenger hunt, and an award ceremony. Don’t miss out! The IMAGES Gallery Talk will be on Thursday, March 28, 2019 at 7 pm. The Gallery speaker is a past IMAGES judge, Paula Tognarelli. Tognarelli is the Director of Griffin Museum of Photography in Massachusetts and is going to walk viewers through the IMAGES exhibition using her photography knowledge and curating skills. Join Shoreline Arts Alliance for an educational talk about photography, art, and the exhibition. Shoreline Arts Alliance is proud to bring IMAGES to the community for the last 38 years. Shoreline Arts Alliance would also like to thank IMAGES sponsors Yale New Haven Health and Milford Photo, two dedicated organizations that make IMAGES possible each year. Learn more about IMAGES by visiting www.shorelinearts.org/images or by contacting office@shorelinearts.org or calling 203.453.3890.